Madagascar is one of the world’s most important biodiversity hotspots. The vast majority of its species of fauna and flora are endemic to the island. Much of Madagascar’s wildlife is under threat, particularly humid forest. The severe poverty that afflicts the island communities is causing serious damage to its environment. Turning these practices around will mean finding ways for locals to benefit from the natural environment. This is where Mitsinjo Association comes in. The organization is composed of the local conservationists who are dedicated towards the conservation of the island’s heritage. It all started when tourists would go into Andasibe village and requested to see the forest. Later in 1999, Mitsinjo was formed by local villagers. “We started as guides only, protecting the forest, trying to plant trees,” told Justin Claude – Mitsinjo Amphibian conservation director. When Justin joined Mitsinjo, he was only seventeen years old. He was the youngest founder in the group. The group embarked on planting trees and conserving the animals that were in danger of extinction. Each member is assigned a particular zone depending on their expertise. One of the members Youssouf Martin is in charge of tree nurseries while Justin is in charge of the Amphibians. When you cultivate plants, do you cultivate peace? “Before, I was a guide and afterwards they asked me to help them do reforestation here. Because I was born here in this village I can do this work because I have much knowledge about the rainforest. This project is a program to plant more native trees. We’re restoring 25 hectares per year so we must grow 30, 000 seedlings with the 60 different species of the native tree,” told Youssouf – Mitsinjo tree nursery specialist. Madagascar is thought to have more than three hundred species of frogs, ninety nine percent of which are endemic. These are one of the most critically endangered creatures on the Island. Hence in 2010, Justin started the amphibian conservation project. The project is the first one of its kind in Madagascar. In 2013, Justin went for training on amphibian conservation in the United States of America. 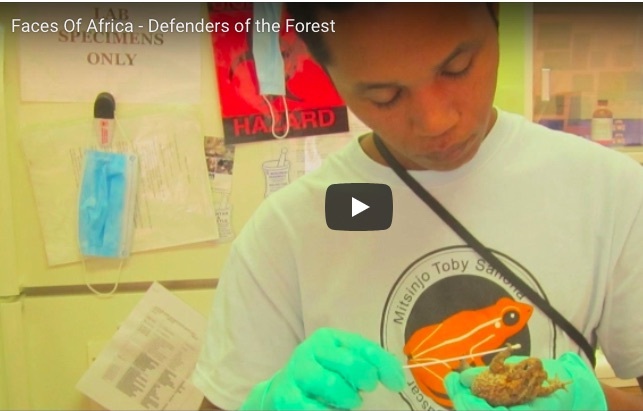 Coming back to Madagascar, he established a breeding facility for the frogs. The facility remains under his supervision. Besides the wildlife being under threat of endangerment, the environment faces serious threats too. Clearance of forests primarily for firewood and charcoal is rampant in Madagascar. Hence the group carries out sensitization forums with the locals to stress on the importance of conserving the forests. This is where education comes in. Mitsinjo engages in a variety of education and capacity building programs for the communities they support, including schools. “Mitsinjo needed a head for environmental education, which also has a link to teaching. I accepted, because I was born here. The environment and love of nature are important to me too. We work with schools all over the region of Andasibe (their village). Over the holidays we create clubs for children who don’t have the money to travel”, said Irene Ramanantenasoa – Mitsinjo environmental education officer. This group of Andasibe local conservationists is working tirelessly to ensure that the glory of its forests is restored and conserved.